Sean J Vincent Blog: Festival De Cannes 2010....the full story. 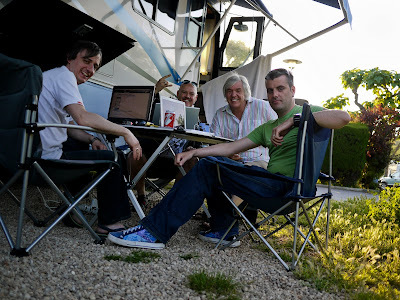 I went down to Cannes with the 'Shoot The DJ' team. We were very lucky to have our Exec Producer Derek along as he drove us all there in a 37ft American Winnebago. This thing was huge.. we traveled in comfort from just north of London all the way to Cannes. 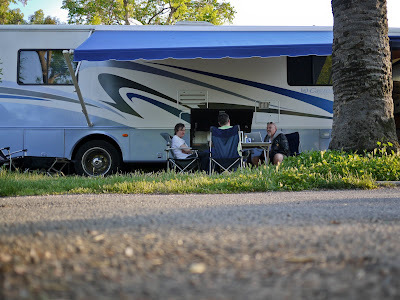 We did two overnight stops along the way, the first just a few hours from Calais and the second in Avignon. We arrived in Cannes on the 15th and drove right along the Croisette looking for the accreditation office. We dived in and quickly grabbed our passes before driving a few more miles to a beautiful campsite just outside Antibes..about 10 miles from Cannes. We got very lucky with where we parked up the bus. (we started referring to it as the bus almost as soon as we got on it....due to our regular trips on tour buses...it was pretty similar) We were about 20 paces from the little bar which was also a pizzeria that did amazing pizzas as well as steak, kebabs...everything. Perfect. The first night, we got dressed up (a bit) and headed into Cannes at around 10pm. Luckily, we were only about 1/4 mile from a bus stop where you can get bus right into the middle of Cannes for 1 Euro! We headed for the Nordisk Film Party. A friend of ours had got us on the guest list and told us who to speak to when we got there. We got there a bit early and there weren't many other people there at first... but it soon filled up. We struggled a little bit to find an opening gambit to get the conversation going with other guests. We enjoyed the free champagne and the free JD, but after an hour of enjoying the drink and the great view from the hotel balcony, we decided it was time to move on. We went straight for the Carlton Hotel. Rick and myself have been to the Midem Music festival in Cannes many times in the past and The Carlton was one of the three hotels where you had to go to meet the right people. This time...it was almost empty. We didn't bother staying for a drink. Next, we headed up to The Majestic. This was a bit busier, but not much. We got a drink and sat outside. A word of warning here: Drinks in Cannes are expensive. 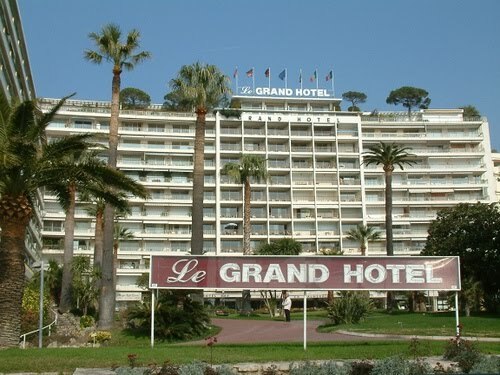 The hotels and clubs on the Croisette will charge up to 10 Euros a pint and sometimes 28 Euros for s short with a mixer. Yes...i know, it's mental...but that's what it costs over there. Start saving now for next year cos you can spend a lot in just a few days. After the Majestic we decided to find out about train times. We knew the buses would not be running late at night, but we had been told we could get a train from Cannes to our campsite at about 1am. We were also told that if we missed this train, the next one was at about 5am! Sooo... we went to see the Concierge at the Carlton... he told us that the last train had left already..(it was 12:15) and the next one wasn't until 4:40am. It was sunday...we forgot. Pants. We considered our options. 2) Walk. It's 10 miles. No chance. We'd get lost. So we tried The Grand. The Grand hotel in Cannes is set back a little bit from the road and there's a huge lawn which they had covered with huge inflatable white sofas and an outside bar with some really funky lighting. Well, this place was a revelation. This is where it is at in Cannes during the film festival. If English is your main language...The Grand is the place for you. The place is rammed with British, American and Australian film people...from producers, financiers, and directors to actors, actresses and crew... this place had them all. The bar wasn't as expensive as some and the drinks were really good. The sofas on the lawn were great and we ended up there every night. The second night we got invited to a yacht party in the harbour. This is the way to do Cannes...free drinks, free food...amazing industry people everywhere... it was great. We met some very influential people and pitched our next project to lots of people. By the second night we had learnt what not to do...and with a little help from our business guru Derek, we got our patter just right. 1) During the day, the Palais is the place to be. Visit the stands, see the Pavilions behind the Palais and generally soak up the atmosphere. There's lots to see and many people to pitch to...(if you dare) and there's even some really good courses/workshops. But deals are rarely done and new business relationships are rarely formed unless you've set up meetings in advance. 2) Early evening is dead...unless you want to go and see a premiere or you have a dinner appointment, give the Croisette a miss before 10pm...even 10 is a bit early. We found getting to the hotels about 11 or 12 was perfect. People are back from their expensive dinners and out of the screenings by then. 3) Don't overdo the pitch. We saw so many people giving it the 'hard sell'...some even tried it on us... they didn't even bother to find out that we weren't looking for other projects to work on. Be friendly, get a round in, remember where you are.... if you're pitching to someone in a bar after midnight...maybe you should just keep it light...swap cards and try to 'get on' so that you can follow it up with an email... then you can decide who is worth spending time on. It also gives you a chance to Google them... there are lots of players out in Cannes....which is point 4..
4) There are lots of 'players' in Cannes. Rich kids who get a bunch of business card printed up before heading to Cannes in their Lambos and Bentleys to see what they can find. Usually they're on the pull...but sometimes they're looking for suckers to drag into their made-up little world. Keep sharp and stay away from dickheads. Conversely, we met a few young producers who were legit...and they were often totally paralytic and full of ego...but their CVs checked out. Tricky... just use your instinct. All in all, our Cannes experience was very positive. We spent 5 days there and we got something positive out of every day. The Short Film Corner was really cool...lovely, helpful people and a really good way to get into the Cannes Festival. We met a few people from Twitter-land over there...including Chris from LivingSpirit (who did the guerilla film makers books). He pointed us in the direction of a distributor who then gave us some invaluable advice and that alone made that particular day worthwhile. Luckily for us, almost every day was like that...an encounter with one person would always lead on to another with someone else who would turn out to be just who we needed. So...now we've got lots and lots of business cards and lots of people to follow up with. We're going to meet some people we met over there, over here and hopefully our trip to Cannes in 2010 has been the boost our next project needed and the 'finale' of 'Shoot The DJ'. Myself and Rick flew from Nice to Germany for a gig before flying home, but André and Derek drove all the way back in the bus. 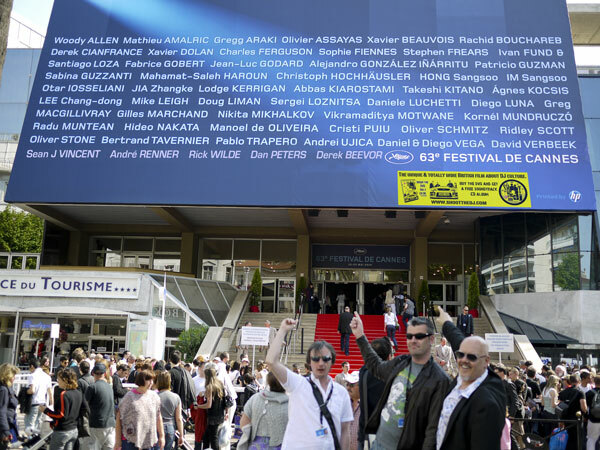 We're already planning how to get the most from next year's Cannes Festival.